Recipes - LetsEat.com.cy More than a just a restaurant directory. 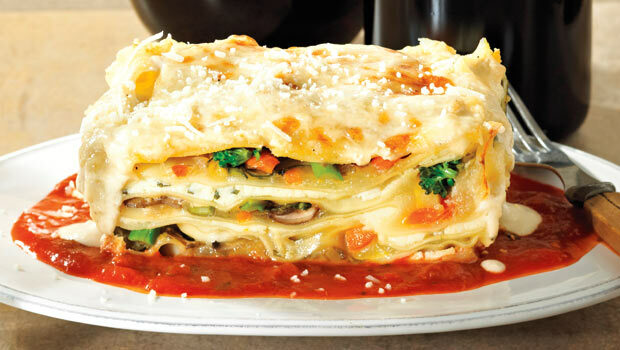 This rich, cheesy lasagna is full of vegetables. 1. Preheat oven to 375°F and lightly grease a 9-by-5-inch loaf pan. Melt butter in a large skillet. Add vegetables and cook over medium heat for 5 minutes to slightly soften. Season with salt and pepper and stir in a small amount of the Alfredo sauce. 2. Stir together ricotta, egg, basil, 2 Tbsp mozzarella and 1/4 cup Parmesan. Place a small amount of Alfredo mixture into the bottom of prepared pan. Place 1 pasta sheet in the bottom and spread with 1/3 the ricotta mixture, 1 pasta sheet, 1/3 the mozzarella and 1/3 the vegetables. Repeat layers twice more ending with pasta. 3. Pour remaining Alfredo over the top and tent with foil. Bake for 45 minutes or until hot and bubbly. Remove foil and top with remaining Parmesan. Bake, uncovered, for 5 minutes more. Let stand for 10 minutes before cutting. Serve on a small pool of marinara sauce with additional Parmigiano Reggiano if desired.